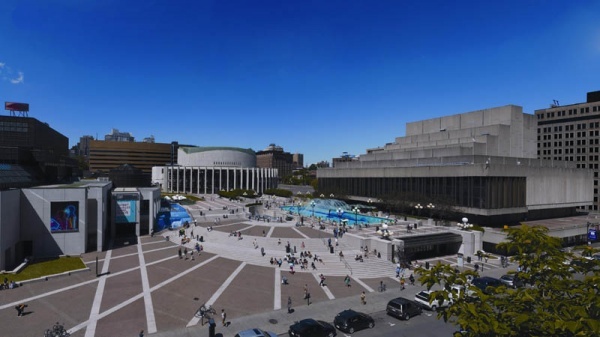 Classified as a building of exceptional heritage value, Place des Arts—which has become an all-important cultural hub—was born of the desire of Montrealers to endow themselves with a concert hall that lived up to the city’s expectations. In 1955, at the initiative of Montréal’s mayor, Jean Drapeau, a group of influential businessmen laid the foundation for the project. The Centre Sir-George-Étienne-Cartier Corporation was officially created in 1958 and it was through this entity that the project was taken to completion. Construction began on February 11, 1961. Made up today of five performance halls comprising of a total of 6,000 seats, Place des Arts also includes rehearsal halls, a costume workshop, warehouses, and office space that make it a true crossroads of Montréal and Québec cultural life, located at the heart of the Quartier des Spectacles in Montréal.